I adore Karen Witemeyer’s novels. I started reading her books back in my early teenage years, starting with books like Head in the Clouds, A Tailor Made Bride, To Win Her Heart, and Short Straw Bride. She always manages to create these perfect characters that you insta-love in these wonderfully imagined historical settings. 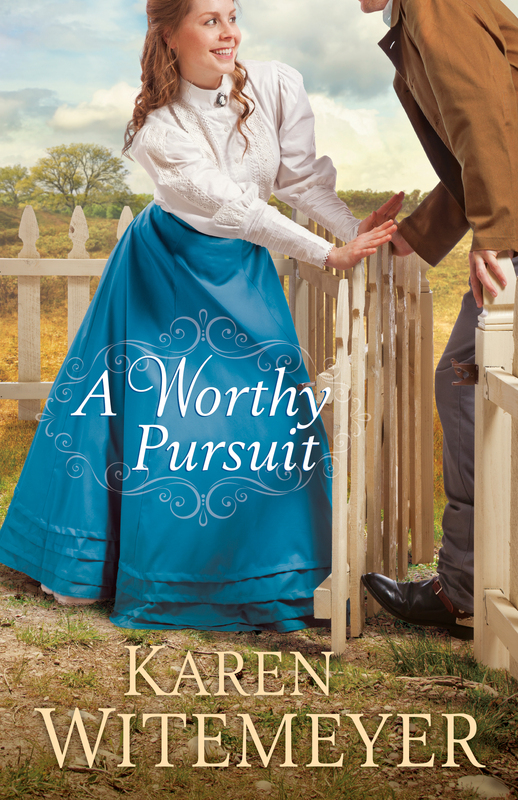 A Worthy Pursuit was no different–cutesy characters that you’ll adore and romance to make you swoon, mixing in some good ole’ Western action and suspense! Charlotte “Miss Lottie” Atherton is a teacher at a school for exceptional youths. She is very attached to her students (three in particular) and even has legal guardianship of one named Lily. When the school’s headmaster unexpectedly (and suspiciously) closes the school mid-term, she knows she can’t leave Lily, Stephen, and John behind to find a new job. She decides takes them with her to a property her parents left her, but things quickly become very complicated. Lily’s unscrupulous grandfather makes up a story of how Charlotte kidnapped his granddaughter, and a “retriever” is sent after them. Stone Hammond thinks a little girl has been stolen, but he is very confused to find that Lily is perfectly content and happy with her kind, pretty “kidnapper.” He sets out to find proof of whether Charlotte’s legal guardianship of Lily is real. Can he trust her? And can she trust him when new dangerous forces head their way? It was just that, super cute and a light fun read, which was exactly what I was looking for at the time. 🙂 Agreed! Her covers are adorbs. Thanks for coming by!